Leonardo DiCaprio and Tom Hardy star in “The Revenant.” Photo Credit: 20th Century Fox. The word revenant is defined as someone who has returned from the dead, which is a fairly good indicator of what’s in store for Leonardo DiCaprio in his new film. The Revenant is set in the 1820’s in the unsettled territory on the US/Canadian border. The story, inspired by true events, has several interesting historical elements, but is really at its core a revenge story. Although audiences may find the film slow at times or even too gory, the fantastic action sequences, visually stunning sets, camerawork, and the performance by DiCaprio make up for its shortcomings. 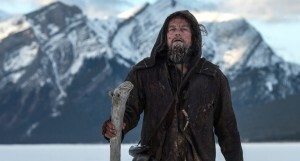 The story centers on Hugh Glass, a fur trapper played by DiCaprio (Wolf of Wall Street, 2015). He is joined by his son, a young Native American named Hawk (played by Forrest Goodluck in his first screen appearance). They serve as scouts for a company of American soldiers and fur trappers and after returning to camp after a hunt, find their colleagues under attack from Pawnee warriors. Although they try and stand their ground, the American company is quickly overwhelmed and must retreat to their boats dodging arrows along the way. As the dozen or so survivors set up camp and take stock of the remaining furs, the audience learns that Glass and Hawk are no strangers to violent raids as they were the lone survivors of an attack on their Indian village which also claimed Hawk’s mother. Although the circumstances of the attack are murky, it’s clear that Hawk is what Glass values most about in the world. Most of this backstory comes in the form of vague flashbacks from Glass and from insults from another trapper named Fitzgerald, played by Tom Hardy (Mad Max: Fury Road, 2015). Fitzgerald, who has a scarred head from a scalping attack, directs much hostility to Glass and his “half-bred” son as he bears hatred for the Native Americans. The next day, as the Company heads back to their fort, Glass while on a scouting mission, accidentally stumbles upon bear cubs and is savagely attacked by an adult grizzly. Although he manages to kill the bear, he is left with severe wounds and his men are in disbelief that he’s still breathing. Captain Henry (Domhall Gleeson, Brooklyn, 2015), who respects Glass’s contributions, has his men haul Glass rather than leave him to die, but the severe weather and mountainous terrain make this nearly impossible. Rather than putting Glass out of his misery, Captain Henry leaves Glass’s son, two volunteers, Fitzgerald and a young soldier to take care of him until help arrives (or bury him if doesn’t make it). The next day, Fitzgerald starts digging a grave, tries to smother Glass, but instead eventually kills Hawk, who intercedes to protect his father. Fitzgerald then flees the camp after convincing the young soldier that Indians are close by, and Glass cannot be saved. We now find Glass lying motionless in a dirt hole next to his dead son. Over the course of the film, Glass refuses to give up and struggles to survive in the wilderness to find the man who killed his son and left him for dead. The heart and soul of this film is the performance by DiCaprio, who does an amazing job on what has been rumored to have been an extremely difficult movie set. The weather conditions and the remote location were challenging. DiCaprio has shown, once again, that he may be one of the greatest actors of his generation. He showcases his physical acting abilities as he very little dialogue, despite having the majority of the screen time. DiCaprio barely resembles the pretty boy persona from Titanic (1997) that made him a worldwide heartthrob, and instead looks more like a grizzled mountain man. Tom Hardy also does an excellent job as the antagonist, Fitzgerald, even though he is difficult to understand with his early frontier accent. Director Alejandro G. Iñárritu (Birdman 2015) deserves praise for capturing the beauty of the American wilderness and creating several vivid action sequences that were truly unique, including the savage bear attack. One potentially valid criticism audiences may have is the runtime of which is exacerbated by the slow middle point of the movie. Still, for those with the endurance, the film provides frontier thrills and a revenge story unlike any you have seen before. Bottom-Line? The Revenant is a film with action and visuals that will best be seen in the theaters. This may also be the performance that finally wins DiCaprio the Oscar that has eluded the accomplished actor for so long. Top 20 Movies of 2015 and More!